G.P. Putnam's Sons Books for Young Readers, 9780399545191, 368pp. No one comes to the Second World on purpose. The doorway between worlds opens only when least expected. The Raft King is desperate to change that by finding the doorway that will finally take him and the people of Raftworld back home. To do it, he needs Pip, a young boy with an incredible gift—he can speak to fish; and the Raft King is not above kidnapping to get what he wants. Pip’s sister Kinchen, though, is determined to rescue her brother and foil the Raft King’s plans. This is but the first of three extraordinary stories that collide on the high seas of the Second World. The second story takes us back to the beginning: Venus and Swimmer are twins captured aboard a slave ship bound for Jamaica in 1781. They save themselves and others from a life of enslavement with a risky, magical plan—one that leads them from the shark-infested waters of the first world to the second. Pip and Kinchen will hear all about them before their own story is said and done. So will Thanh and his sister Sang, who we meet in 1978 on a small boat as they try to escape post-war Vietnam. But after a storm and a pirate attack, they’re not sure they’ll ever see shore again. 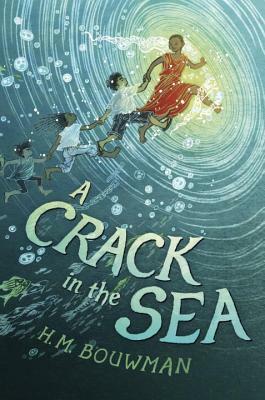 What brings these three sets of siblings together on an adventure of a lifetime is a little magic, helpful sea monsters and that very special portal, A Crack in the Sea. H.M. Bouwman is the author of The Remarkable & Very True Story of Lucy & Snowcap (Marshall Cavendish, 2008). An associate professor of English at the University of St. Thomas, she lives in St. Paul, Minnesota, with her two sons. A Crack in the Sea is her second novel. Yuko Shimizu is a Japanese illustrator based in New York City and an instructor at the School of Visual Arts. In 2009, Newsweek Japan chose Yuko as one of the “100 Japanese People the World Respects.” Yuko is the illustrator of the picture book Barbed Wire Baseball, and her work can also be seen on Gap T-shirts, Pepsi cans, Visa billboards, and Microsoft and Target ads, as well as on numerous book covers and in the pages of The New York Times, Time, Rolling Stone, The New Yorker and many others.